Have you ever wondered what are the benefits of engineered hardwood floors or normal hardwood floors? Allow us to help you understand! Firstly, engineered hardwood floors are different than laminate floors. Engineered hardwood floors are cost effective and a gorgeous option for any room within your house and even office. One thing you may not know is engineered hardwood is a real hardwood strip that’s bonded to a bottom layer of compressed repurposed wood. Because the top layer is made from a hardwood strip retaining the natural wood grain, it looks exactly like hardwood. However, because the underlying layers are not a solid wood board, the fiberboard provides mores stability and strength. Engineered hardwood flooring is made to resist moisture and sustain the temperature fluctuations that occur throughout the seasons. This makes engineered hardwood flooring ideal for those moisture heavy locations like your bathroom. The strength of engineered hardwood floors will bring lasting value to the home. There are a lot of benefits that come with engineered hardwood flooring. One of those benefits is its ability to be installed over a variety of surfaces. With traditional hardwood flooring you are required to have an existing subfloor. However, with engineered hardwood you can install directly over concrete or existing flooring. Another benefit of engineered hardwood flooring is the variety of woods, colors, and styles you can choose from! 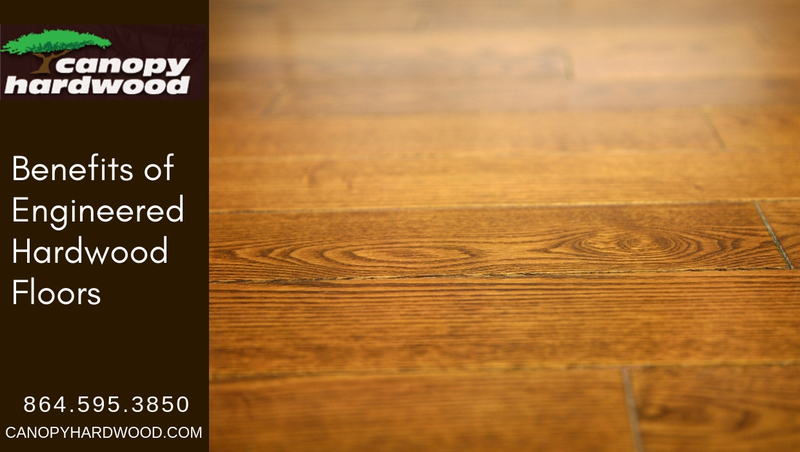 If you are interested in engineered hardwood floors for your home or office, contact us today!